"Want a quick and easy Mac n' Cheese that looks like you spent all day working on it? This is the recipe." Place the diced onion in a large pot of lightly-salted water; bring to a boil. Cook the pasta until al dente, 8 to 10 minutes; drain. Transfer the onion and pasta to a casserole dish; season with salt, pepper, and garlic salt. Stir the butter and brown sugar into the pasta mixture until the butter melts. Add the Cheddar cheese soup, Havarti cheese, Parmesan cheese and 1/3 cup of Cheddar cheese; stir well. Sprinkle remaining Cheddar cheese over top of the dish. Bake in preheated oven about 45 minutes. Change oven setting to 'Broil' and cook until top is golden brown, about 4 minutes. 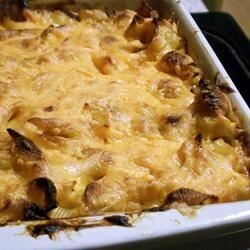 A classic creamy mac 'n cheese dish that's amped up with flavor! I made this recipe for a church gathering and everyone raved about it. The only thing I changed was using less brown sugar. Everyone said it was the best mac & cheese they ever had! Delicious! I tried making the same recipe with Kraft Mozza Cheddar Shredded Cheese and it was amazing!! !